A musician by trade, Matthew Mainster began writing Giggleswick on the backs of his piano scores while holed up in practice rooms throughout college. 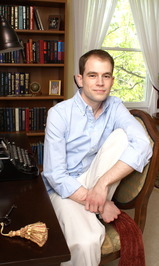 He is a graduate of Lebanon Valley College and Yale University, and lives with his family in Maryland. Matthew Mainster hasn't written any blog posts yet. Hilarious and charming! Would make a decent chick flick. It was a nice escapist read. We’d love your help. Let us know what’s wrong with this preview of Birthright by Nora Roberts.